We left New York on October 7th. Has it really only been a month? We feel entrenched in the little community of La Punta, but we still have so many nearby sites to visit (Laguna de Manialtepec, the hot springs, botanical gardens…) We’re going to stay at least one extra week than originally planned, so that Michael can enjoy some of La Punta’s fun waves, and so we can check out a few of those sites we’ve heard about. We’ve given ourselves a rough target budget of $60 per day for both of us, for the entire trip. I know it’s a little ambitious, especially in places like Australia, New Zealand, and the South Pacific, but we’re hoping to be under budget in certain other places to compensate, and try out money-saving strategies such as couchsurfing and housesitting, if we can. Our $60-a-day budget doesn’t include airfare, but it does include inter-city bus transportation, local transportation, food, accommodations, entertainment and other living expenses. So, how have we been doing so far in our first month here? We’re doing pretty well, staying nicely under budget. We had hoped to be a little more under budget, to try and create a cushion for later in the trip when we hit the more expensive countries, but we’re still not doing too badly. Accommodations and food are our number one costs right now. We’re not doing much touristy stuff since Michael hasn’t been too mobile for the past couple of weeks, but we’re also more interested in discovering everyday local life than doing a lot of sightseeing. A lot of our entertainment is derived from free or cheap activities, like wandering around neighborhoods in the town center, discovering every nook and cranny of the market, and — obviously — surfing. Renting an apartment by the month, you can negotiate a better per-night price than if renting by the day or week. N.B. We’re paying a bit of a premium for our apartment compared to other places around here, by backpacking standards, but we have the luxury of being one block away from the point break, our own kitchen, a lot of space (photos of our apartment to come in another post soon) and really cool hosts with whom we enjoy hanging out. We met a friendly surfer from New Zealand in the lineup who was staying at a place called Casa de Dan y Carmen, and his rent was half the amount we’re paying. 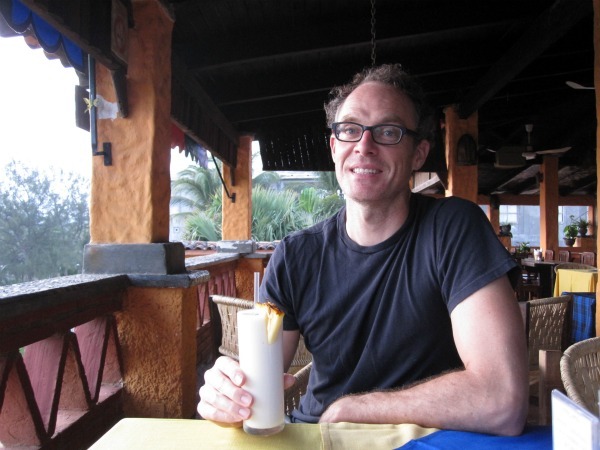 He apparently had a lot of space and a kitchen, too, but the location is at Playa Zicatela, and it took 20 minutes walking, or a bus or colectivo ride, to get to La Punta. We couldn’t recommend Las Palomas (the apartment where we’re staying) more. The owners, Kim and Robert, are a super cool couple who have been extremely generous and helpful, and have made us feel at home. If you ever head over here, I can give you their info to check into renting an apartment for by the day, week or month. We cook at home about 70% of the time. This saves us a lot of money. We both love to cook, so it’s not a chore, and we enjoy shopping at the market and the grocery store, discovering new fruits and vegetables, and imitating dishes we sample in the area. A few of the delicious meals we’ve prepared ourselves are tortilla soup, fresh guacamole and nacho chips, and lots of different variations of veggie tacos (using rice, beans, tomatoes, zucchini, eggplant, queso fresco and homemade jalapeno salsa). Most local restaurants have a comida corrida around lunch or early dinnertime. It’s a set meal that often includes a glass of juice, soup, choice of main dish, and dessert. They’re incredibly good deals: our favorite Oaxacan restaurant, Las Margaritas, has a 40-peso comida corrida — that’s under $3! Eating lunch out is also usually cheaper than eating dinner out. We often eat out at lunch, and prepare dinner at home. Puerto Escondido is a town where you could really survive on a tighter budget than we’ve been following, but we feel like we’ve gotten good value for our money and have been having a great time. There are hostels here that cost 7 bucks a night for a dorm bed, or $13 a night for a bungalow with shared bathroom, and you could eat at small taquerias every day for about $3 a meal. The bus into town costs 10 pesos (around 75 cents); if you want to splurge on a cab instead, it’s $2. A beer from the deli is 50 cents; in a restaurant it’s around $1.50. We had tasty made-in-house Italian gelato tonight for $2.20 for two scoops. Most restaurants in Zicatela have happy hour every day between 5 and 7 pm. We had 2 pina coladas for $3.50 and watched the sun set from the rooftop terrace of the Hotel Arco Iris tonight. looks like you’re getting some good waves this week! I love every post. And I might have to comment that “I love every post” on every post. Sorry. That’s just the breaks I guess. 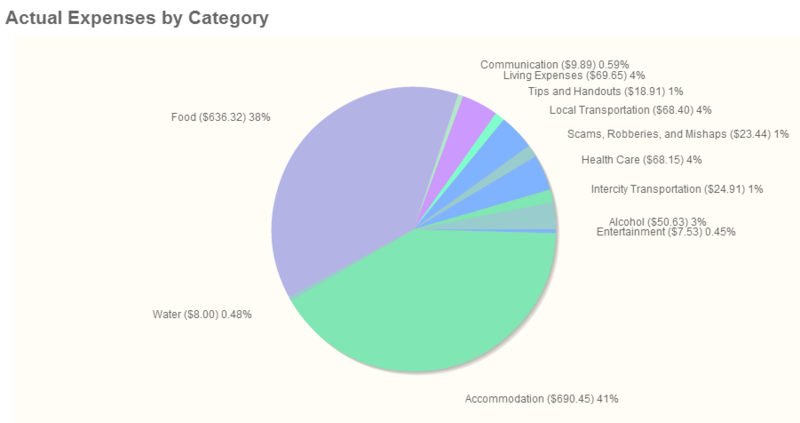 Is “scams, robberies and mishaps” your category invention, or BudgetYourTrip’s? 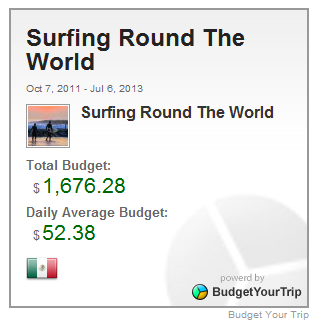 Ha ha, it’s BudgetYourTrip’s category! That cost was a new pair of Havaianas because I left mine on the beach while I was surfing and they were stolen. I just walk there barefoot now.